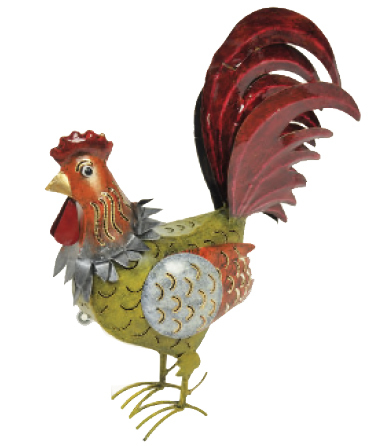 If you enjoy amazing rooster kitchen decor, or simply need a fabulous rooster decoration for your home, you'll be thrilled with our 13" Bali Rooster Bird Lantern. A unique Thanksgiving home decor item, this Bali Rooster lantern will look fabulous in your kitchen, and make for a stunning thanksgiving table decoration. All metal, buffed, primed, sealed - and absolutely amazing! Full of rich detail, this 3D metal rooster decoration is unique and built to last. Hand-crafted in Bali, this metal rooster lantern has a special surprise - simply lift one of the feathers and slide in a votive candle and watch as this Rooster decor lantern lights up your life! Size: 15" x 5.5" x 13"